1. The tabled card is lying lengthwise in front of the performer. The left fingers hold the inner left corner of the tabled card. The left thumb is under the corner and the left 1st and 2nd fingers are on top of this corner. The right hand has a card in Rear Flat Palm and is resting on the table with the four fingers curled under the front end of the palmed card. 2. You are about to look at your "Hole Card." To do this the right hand extends its fingers, then comes over on top of the tabled card. Position of both hands is now as in Figure 91. 3. Two actions take place together. The right hand tilts upward and the left hand also tilts its card upward and behind the right hand. 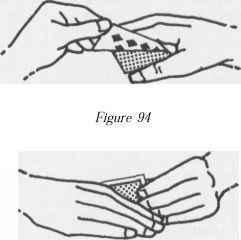 This is apparently done so no one else can see your "Hole Card"; however, what really goes on is that the left fingers place its card against and in line with the palmed card in the right hand as in Figure 92. 92 except note that now the under card will be pulled forward by the left thumb and 1st and 2nd fingers. 5. As the left fingers pull out the card both hands move down to the table and end up again as in Figure 91 where the under card will now be the one in view. The left fingers keep the new tabled card in view as right hand moves away with its card Rear Flat Palmed. 93 shows the new card tilted upward as right fingers curl in towards the palm to keep the palmed card in place. Both hands work close to the surface of the table during the Switch. the table during the Switch. 1. The tabled card is held with the left fingers, thumb on bottom and fingers on top, at the inner left corner. The card in the right hand is in a Rear Flat Palm position but a little more forward towards the fingertips. 2. The right hand comes over on top of the tabled card to completely cover it. Right here the left fingers release the tabled card so it remains against the table. Immediately the left fingers and thumb grasp the upper left corner of the palmed card and pull it inwards and out of the right hand, for a short distance, as in Figure 94. Here you will note how the left fingers have bent up the card as if to look at its face. The Figure 95 shows how this looks to the audience. 3. As the left fingers keep the card in place, as per Figure 94 and 95, the right thumb is lowered so the side of right thumb is pressed against the tabled card. 4. With the right thumb keeping the tabled card in place, the left fingers can pull out the new card to the position shown in Figure 93. From here you can do a Turnover or a Turndown of the card. 5. The card, which is still under the right hand, can be brought into a Rear Flat Palm using the Flat Card Pickup or you can merely slide the card to the edge of the table and work from there into any desired position. Eventually the palmed card is unloaded. 6. A good chance for the right hand to do the Flat Card Pickup is at the time the new card is in the position shown in Figure 93. You have plenty of cover for the bending in of the right 1st finger. I have decided to insert this Switch here in that it does make a good exhibition but can be used in some way in a magical effect. Also this Switch does not need any of the special type palms but uses the regular palm. 1. The tabled card, which can be shown before being placed face down, is near the performer. The right hand has a card in the usual standard full palm position. 2. The right hand now apparently shoves the card towards a spectator; however, what actually happens is this: The right hand is placed over the tabled card in such a manner that the heel of the palm will contact the back end of the tabled card. Thus the actual palmed card, in right hand, is in advance of the tabled card while the tabled card is directly under the right palm, below the base of the fingers. The Figure 96 shows how the two cards lie under the right hand with X being the under card which will be held back. 3. As soon as the right hand is placed over the tabled card, the right hand moves forward. At the same time the front or originally palmed card is shot out, from under the right hand, towards the spectator. This action is seen in Figure 97. The arrow alongside the right hand shows the right hand now moving back towards the edge of the table. 4. When the card comes out from under the right hand, the right hand moves back to the edge of the table where the held out card is allowed to fall into the lap. Immediately the right hand turns palm upwards in a gesture for the spectator to turn the tabled card face up. The right hand travels to the edge of the table only as far as is necessary to let the held out card fall into the lap. This means that the right fingertips will still be touching the table as the hand is turned palm up. your hand on it", will give a logical excuse, especially for the turning of the right hand palm up, as you reach the words, "palm of your hand". As you say, "on it", the right hand is turned palm down in another gesture of what to do. 6. The smoother the working surface the easier this Switch will work; however, the normal cloth covered surface will be no deterrent to the move except that the forward and backward action of the right hand will have to be a little sharper in order to shoot out the palmed card as in Figure 97. While the action has been explained as a forward one it can be done to either side of the performer. The card in this case will exit from under the side of the palm. This is shown in Figure 98 where you will note that in this instance the right fingers need not be extended. While most Switches so far described are those done seated at a table the ones that follow are of a specialized sort designed mostly for magical purposes and done standing at the table. However, they can at times be accomplished while seated.